Imagine this. It’s a warm summer evening; the soft breeze is blowing in your gorgeous sheer wedding dress as the last sunrays illuminate your beautiful face. Your husband-to-be can’t stop looking at you, as his eyes tell you that he is falling in love with you all over again at that very moment. This is the moment that every woman dreams of; a moment of beauty, pure happiness, and love. If this idyllic scene doesn’t convince you to go for a beach wedding, then it may be time for me to do a little more convincing! I want to give you an inside look at the inner workings of a beach wedding, as well as share the benefits of a having a beach wedding. Think of the beach as your white canvas, complete with all the natural elements and scenery at your disposal. You already have the advantage of planning an unforgettable wedding because you don’t have to worry about dealing with the frantic search of a church and reception venue. Take a huge sigh of relief! 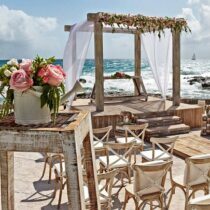 Regardless if you plan a formal or informal wedding, you have the option of doing whichever one you choose on a captivating shore that is sure to take everyone’s breath away. Wait, you’re not totally out of the woods quite yet! Although you do not have to worry about finding the right building venue, you still need to decide where your perfect beach location would be. But who doesn’t like searching for beaches? Your perfect location could be the city beach just a few blocks from your home or an exotic destination beach that you always wanted to visit. The options are virtually endless and the sky is your limit! Another thing to note is that your theme doesn’t have to be aquatic or nautical just because you are on the beach! You are the creator of your big day and can choose whatever you like. Let nature inspire you in the wildest ways! 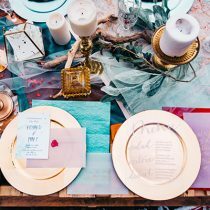 Colors like turquoise, coral, pink, yellow, and cream are all great colors that will compliment your beach wedding in a stunning way. Did I mention that the very best thing about choosing a beach wedding is that the natural surroundings need less decoration than any other venue? What a lucky bride you are! 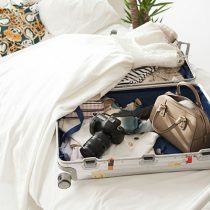 Another advantage to choosing a beach wedding is that having your wedding and reception on the beach saves you from the hassle of transportation organization, the usual guest delays, the stress of dealing with misplaced items (and sometimes clothes) and generally makes it easier for you, your handsome groom and the guests. For reception options, you can pick a restaurant on the beach, arrange big tents with a magnificent color and décor scheme, or just celebrate your union with friends and family right under the bright summer sky for the rest of the night. Have you heard of brides who initially plan a wedding for 50 people and then end up with 150 guests? Trust me; it happens a lot more than you may think! In traditional wedding planning, changing the number of the participants can lead to the necessity of changing the venue. If you have ever witnessed your loved ones going through this while they planned their wedding, you would know that it not only causes more stress to the planning but also may resort to the bride having the sudden urge to rip her hair out! If you choose to plan a beach wedding, there is always room for more, no matter who may come unannounced. To remedy this, you can easily add a few more chairs, arrange more tables or tents and surround yourself with more friends. How easy is that? I think you deserve to take another sigh of relief! Usually weddings that take place in hotels and resorts are limited in terms of time. In most places, you are only allowed to make noise until midnight in respect to the other guests who are there at that time. If you plan your big day at the beach, the party can go all night or until your legs turn into noodles, whichever one comes first. Imagine how awesome it would be to meet the sunrise with your wedding dress still on, tired as hell, but happier than ever before with a fine-looking new husband on your arm! Your guests will tell stories about the wedding of the year for the REST of the year! However, before you plan the biggest beach party of your life, it is important to note that depending on your location of choice, there may be local noise ordinances, restrictions and required permits to deal with in order to hold a ceremony on the beach. What place is more romantic than the beach? Endless horizons, spectacular views, golden sands and crystal clear waters make the perfect background for a wedding photo shoot. Choose a secluded spot by the water, on a rock, on a bridge or deck and sink into the bliss while the photographer captures this perfect moment. You want to be absolutely sure that you choose the best photographer for this very special day. In this world, you get what you pay for, and when it comes to your photos that will last a lifetime, you certainly do not want to go the cheap route. Taking your wedding off the traditional path also ensures you a hassle free event when it comes to your family. The elderly part of the family tends to stick to old habits and always has an opinion about each and every detail. With them, local churches and venues must be approached with high caution and it’s very likely that you will hear “Why am I not at the head of table?” or “You should have your wedding where your cousins did.” Do you really want the headache of hearing others opinions about YOUR big day? If not, here is a solution: if you keep your planning ideas to yourself and surprise your relatives with a beach wedding, you’ll have a chance to actually enjoy the day that will change your life forever without all that nagging. A beach wedding could save you a ton of money. Cha-Ching! The beach is the perfect place for a budget wedding. If you’re not a really extravagant person and enjoy simplistic living, then a beach wedding is the way to go. There is no need for decorations; take advantage of the masterpiece that nature has created and just go with the flow! There is no need for fancy and expensive dinners; plan a cocktail after the wedding and get a talented friend to sing or play a guitar as a wedding gift. Gather your closest friends and celebrate the love you and your future husband are sharing because that’s what really matters most. For me, a beach wedding was not a choice. I was born and raised by the seashore, so there were never any other options that I would want to consider! This is why I can give you first-hand advice on why a beach wedding would be one of the best decisions you ever made. So start getting your wedding planning book together and take advantage of this wonderful adventure!